We're spotlighting some of our BBC employees from around the country– including military veterans and spouses– in recognition of NAA's RPM Careers Month! 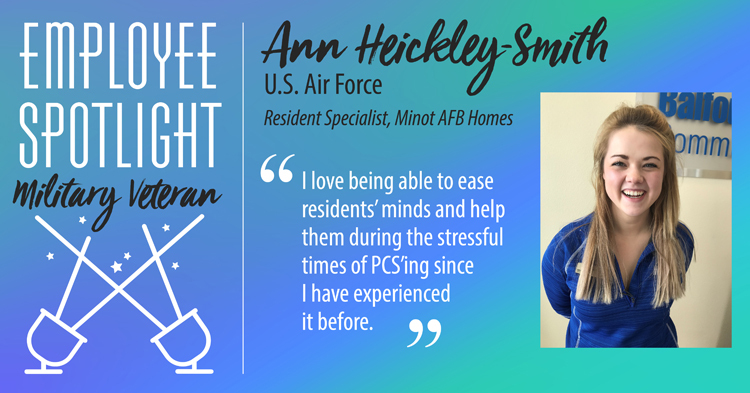 Continue reading to learn more about Ann Heickley-Smith, resident specialist. How many years did you serve in the military? Total of 4 years. What made you decide to continue your career in the military field after your time as an active duty service member? My husband still serves. I also love the military community—it’s familiar and comfortable to me. How long have you worked for BBC? Just started about a month ago and I love it! What do you enjoy most about your job and working with military families? I love being able to ease their minds and help them, during the stressful times of PCS’ing since I have experienced it before.